This article is about the legislative institution. For other uses, see Parliament (disambiguation). The term is similar to the idea of a senate, synod or congress, and is commonly used in countries that are current or former monarchies, a form of government with a monarch as the head. Some contexts restrict the use of the word parliament to parliamentary systems, although it is also used to describe the legislature in some presidential systems (e.g. the French parliament), even where it is not in the official name. Historically, parliaments included various kinds of deliberative, consultative, and judicial assemblies, e.g. mediaeval parlements. The English term is derived from Anglo-Norman and dates to the 14th century, coming from the 11th century Old French parlement, from parler, meaning "to talk". The meaning evolved over time, originally referring to any discussion, conversation, or negotiation through various kinds of deliberative or judicial groups, often summoned by a monarch. By the 15th century, in Britain, it had come to specifically mean the legislature. Ancient Athens was the cradle of democracy. The Athenian assembly (ἐκκλησία, ekklesia) was the most important institution, and every free male citizen could take part in the discussions. Slaves and women could not. However, Athenian democracy was not representative, but rather direct, and therefore the ekklesia was different from the parliamentary system. 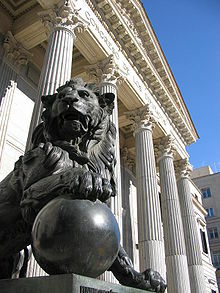 The Congress of Deputies, lower house of the Spanish Parliament. Although there are documented councils held in 873, 1020, 1050 and 1063, there was no representation of commoners. What is considered to be the first parliament (with the presence of commoners), the Cortes of León, was held in the Kingdom of León in 1188. According to the UNESCO, the Decreta of Leon of 1188 is the oldest documentary manifestation of the European parliamentary system. In addition, UNESCO granted the 1188 Cortes of Alfonso IX the title of "Memory of the World" and the city of Leon has been recognized as the "Cradle of Parliamentarism". After coming to power, King Alfonso IX, facing an attack by his two neighbors, Castile and Portugal, decided to summon the "Royal Curia". This was a medieval organisation composed of aristocrats and bishops but because of the seriousness of the situation and the need to maximise political support, Alfonso IX took the decision to also call the representatives of the urban middle class from the most important cities of the kingdom to the assembly. León's Cortes dealt with matters like the right to private property, the inviolability of domicile, the right to appeal to justice opposite the King and the obligation of the King to consult the Cortes before entering a war. Prelates, nobles and commoners met separately in the three estates of the Cortes. In this meeting new laws were approved to protect commoners against the arbitrarities of nobles, prelates and the king. This important set of laws is known as the Carta Magna Leonesa. Following this event, new Cortes would appear in the other different territories that would make up Spain: Principality of Catalonia in 1192, the Kingdom of Castile in 1250, Kingdom of Aragon in 1274, Kingdom of Valencia in 1283 and Kingdom of Navarre in 1300. After the union of the Kingdoms of Leon and Castile under the Crown of Castile, their Cortes were united as well in 1258. The Castilian Cortes had representatives from Burgos, Toledo, León, Seville, Córdoba, Murcia, Jaén, Zamora, Segovia, Ávila, Salamanca, Cuenca, Toro, Valladolid, Soria, Madrid, Guadalajara and Granada (after 1492). The Cortes' assent was required to pass new taxes, and could also advise the king on other matters. The comunero rebels intended a stronger role for the Cortes, but were defeated by the forces of Habsburg Emperor Charles V in 1521. The Cortes maintained some power, however, though it became more of a consultative entity. However, by the time of King Philip II, Charles's son, the Castilian Cortes had come under functionally complete royal control, with its delegates dependent on the Crown for their income. The Cortes of the Crown of Aragon kingdoms retained their power to control the king's spending with regard to the finances of those kingdoms. But after the War of the Spanish Succession and the victory of another royal house – the Bourbons – and King Philip V, their Cortes were suppressed (those of Aragon and Valencia in 1707, and those of Catalonia and the Balearic islands in 1714). Claims that Spain was united under the Catholic Monarchs in the late 15th century are belied by these facts; moreover, the very first Cortes representing the whole of Spain (and the Spanish empire of the day) did not assemble until 1812, in Cadiz, where it operated as a government in exile for, ironically, at that time most of the rest of Spain was in the hands of Napoleon's army. England has long had a tradition of a body of men who would assist and advise the king on important matters. Under the Anglo-Saxon kings, there was an advisory council, the Witenagemot. The name derives from the Old English ƿitena ȝemōt, or witena gemōt, for "meeting of wise men". The first recorded act of a witenagemot was the law code issued by King Æthelberht of Kent ca. 600, the earliest document which survives in sustained Old English prose; however, the witan was certainly in existence long before this time. The Witan, along with the folkmoots (local assemblies), is an important ancestor of the modern English parliament. As part of the Norman Conquest of England, the new king, William I, did away with the Witenagemot, replacing it with a Curia Regis ("King's Council"). Membership of the Curia was largely restricted to the tenants in chief, the few nobles who "rented" great estates directly from the king, along with ecclesiastics. William brought to England the feudal system of his native Normandy, and sought the advice of the curia regis before making laws. This is the original body from which the Parliament, the higher courts of law, and the Privy Council and Cabinet descend. 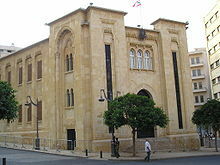 Of these, the legislature is formally the High Court of Parliament; judges sit in the Supreme Court of Judicature. Only the executive government is no longer conducted in a royal court. Most historians date the emergence of a parliament with some degree of power to which the throne had to defer no later than the rule of Edward I. Like previous kings, Edward called leading nobles and church leaders to discuss government matters, especially finance. A meeting in 1295 became known as the Model Parliament because it set the pattern for later Parliaments. The significant difference between the Model Parliament and the earlier Curia Regis was the addition of the Commons; that is, the inclusion of elected representatives of rural landowners and of townsmen. In 1307, Edward I agreed not to collect certain taxes without the consent of the realm. He also enlarged the court system. A 1215 edition of the Magna Carta, as featured on display at the British Library. During the reign of King Henry III, 13th-Century English Parliaments incorporated elected representatives from shires and towns. These parliaments are, as such, considered forerunners of the modern parliament. In 1265, Simon de Montfort, then in rebellion against Henry III, summoned a parliament of his supporters without royal authorization. The archbishops, bishops, abbots, earls, and barons were summoned, as were two knights from each shire and two burgesses from each borough. Knights had been summoned to previous councils, but it was unprecedented for the boroughs to receive any representation. Come 1295, Edward I later adopted de Montfort's ideas for representation and election in the so-called "Model Parliament". At first, each estate debated independently; by the reign of Edward III, however, Parliament recognisably assumed its modern form, with authorities dividing the legislative body into two separate chambers. The purpose and structure of Parliament in Tudor England underwent a significant transformation under the reign of Henry VIII. Originally its methods were primarily medieval, and the monarch still possessed a form of inarguable dominion over its decisions. According to Elton, it was Thomas Cromwell, 1st Earl of Essex, then chief minister to Henry VIII, who initiated still other changes within parliament. The Reformation Acts supplied Parliament with unlimited power over the country. This included authority over virtually every matter, whether social, economic, political, or religious; it legalised the Reformation, officially and indisputably. The king had to rule through the council, not over it, and all sides needed to reach a mutual agreement when creating or passing laws, adjusting or implementing taxes, or changing religious doctrines. This was significant: the monarch no longer had sole control over the country. For instance, during the later years of Mary, Parliament exercised its authority in originally rejecting Mary's bid to revive Catholicism in the realm. Later on, the legislative body even denied Elizabeth her request to marry. If Parliament had possessed this power before Cromwell, such as when Wolsey served as secretary, the Reformation may never have happened, as the king would have had to gain the consent of all parliament members before so drastically changing the country's religious laws and fundamental identity. The power of Parliament increased considerably after Cromwell's adjustments. It also provided the country with unprecedented stability. More stability, in turn, helped assure more effective management, organisation, and efficiency. Parliament printed statutes and devised a more coherent parliamentary procedure. The rise of Parliament proved especially important in the sense that it limited the repercussions of dynastic complications that had so often plunged England into civil war. Parliament still ran the country even in the absence of suitable heirs to throne, and its legitimacy as a decision-making body reduced the royal prerogatives of kings like Henry VIII and the importance of their whims. For example, Henry VIII could not simply establish supremacy by proclamation; he required Parliament to enforce statutes and add felonies and treasons. An important liberty for Parliament was its freedom of speech; Henry allowed anything to be spoken openly within Parliament and speakers could not face arrest – a fact which they exploited incessantly. Nevertheless, Parliament in Henry VIII's time offered up very little objection to the monarch's desires. Under his and Edward's reign, the legislative body complied willingly with the majority of the kings' decisions. Much of this compliance stemmed from how the English viewed and traditionally understood authority. As Williams described it, "King and parliament were not separate entities, but a single body, of which the monarch was the senior partner and the Lords and the Commons the lesser, but still essential, members.". The statue of Oliver Cromwell, as it stands outside the House of Commons at the Palace of Westminster. Although its role in government expanded significantly during the reigns of Henry VIII and Edward VI, the Parliament of England saw some of its most important gains in the 17th century. A series of conflicts between the Crown and Parliament culminated in the execution of King Charles I in 1649. Afterward, England became a commonwealth, with Oliver Cromwell, its lord protector, the de facto ruler. Frustrated with its decisions, Cromwell purged and suspended Parliament on several occasions. 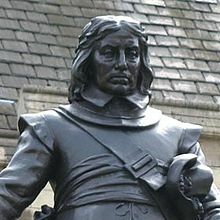 A controversial figure accused of despotism, war crimes, and even genocide, Cromwell is nonetheless regarded as essential to the growth of democracy in England. The years of the Commonwealth, coupled with the restoration of the monarchy in 1660 and the subsequent Glorious Revolution of 1688, helped reinforce and strengthen Parliament as an institution separate from the Crown. The Parliament of England met until it merged with the Parliament of Scotland under the Acts of Union. This union created the new Parliament of Great Britain in 1707. The debating chamber of the reconvened Scottish Parliament from the public gallery. Following the Scottish devolution referendum, 1997, and the passing of the Scotland Act 1998 by the Parliament of the United Kingdom, the Scottish Parliament was reconvened on 1 July 1999, although with much more limited powers than its 18th-century predecessor. The parliament has sat since 2004 at its newly constructed Scottish Parliament Building in Edinburgh, situated at the foot of the Royal Mile, next to the royal palace of Holyroodhouse. A thing or ting (Old Norse and Icelandic: þing; other modern Scandinavian: ting, ding in Dutch) was the governing assembly in Germanic societies, made up of the free men of the community and presided by lawspeakers. The Icelandic, Faroese and Manx parliaments trace their origins back to the Viking expansion originating from the Petty kingdoms of Norway as well as Denmark, replicating Viking government systems in the conquered territories, such as those represented by the Gulating near Bergen in western Norway. The Icelandic Althing, dating to 930. The Faroese Løgting, dating to a similar period. The Manx Tynwald, which claims to be over 1,000 years old. Today the term lives on in the official names of national legislatures, political and judicial institutions in the North-Germanic countries. In the Yorkshire and former Danelaw areas of England, which were subject to much Norse invasion and settlement, the wapentake was another name for the same institution. The Sicilian Parliament, dating to 1097, evolved as the legislature of the Kingdom of Sicily. The Federal Diet of Switzerland was one of the longest-lived representative bodies in history, continuing from the 13th century to 1848. Originally, there was only the Parliament of Paris, born out of the Curia Regis in 1307, and located inside the medieval royal palace, now the Paris Hall of Justice. The jurisdiction of the Parliament of Paris covered the entire kingdom. In the thirteenth century, judicial functions were added. In 1443, following the turmoil of the Hundred Years' War, King Charles VII of France granted Languedoc its own parliament by establishing the Parliament of Toulouse, the first parliament outside of Paris, whose jurisdiction extended over the most part of southern France. From 1443 until the French Revolution several other parliaments were created in some provinces of France (Grenoble, Bordeaux). All the parliaments could issue regulatory decrees for the application of royal edicts or of customary practices; they could also refuse to register laws that they judged contrary to fundamental law or simply as being untimely. Parliamentary power in France was suppressed more so than in England as a result of absolutism, and parliaments were eventually overshadowed by the larger Estates General, up until the French Revolution, when the National Assembly became the lower house of France's bicameral legislature. The term "sejm" comes from an old Polish expression denoting a meeting of the populace. The power of early sejms grew between 1146–1295, when the power of individual rulers waned and various councils and wiece grew stronger. The history of the national Sejm dates back to 1182. Since the 14th century irregular sejms (described in various Latin sources as contentio generalis, conventio magna, conventio solemna, parlamentum, parlamentum generale, dieta or Polish sejm walny) have been called by Polish kings. From 1374, the king had to receive sejm permission to raise taxes. The General Sejm (Polish Sejm Generalny or Sejm Walny), first convoked by the king John I Olbracht in 1493 near Piotrków, evolved from earlier regional and provincial meetings (sejmiks). It followed most closely the sejmik generally, which arose from the 1454 Nieszawa Statutes, granted to the szlachta (nobles) by King Casimir IV the Jagiellonian. From 1493 forward, indirect elections were repeated every two years. With the development of the unique Polish Golden Liberty the Sejm's powers increased. The Commonwealth's general parliament consisted of three estates: the King of Poland (who also acted as the Grand Duke of Lithuania, Russia/Ruthenia, Prussia, Mazovia, etc. 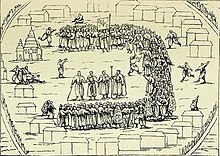 ), the Senat (consisting of Ministers, Palatines, Castellans and Bishops) and the Chamber of Envoys—circa 170 nobles (szlachta) acting on behalf of their Lands and sent by Land Parliaments. Also representatives of selected cities but without any voting powers. Since 1573 at a royal election all peers of the Commonwealth could participate in the Parliament and become the King's electors. Cossack Rada was the legislative body of a military republic of the Ukrainian Cossacks that grew rapidly in the 15th century from serfs fleeing the more controlled parts of the Polish Lithuanian Commonwealth. The republic did not regard social origin/nobility and accepted all people who declared to be Orthodox Christians. Originally established at the Zaporizhian Sich, the rada (council) was an institution of Cossack administration in Ukraine from the 16th to the 18th century. With the establishment of the Hetman state in 1648, it was officially known as the General Military Council until 1750. The zemsky sobor (Russian: зе́мский собо́р) was the first Russian parliament of the feudal Estates type, in the 16th and 17th centuries. The term roughly means assembly of the land. The name of the parliament of nowadays Russian Federation is the Federal Assembly of Russia. The term for its lower house, State Duma (which is better known than the Federal Assembly itself, and is often mistaken for the entirety of the parliament) comes from the Russian word думать (dumat), "to think". The Boyar Duma was an advisory council to the grand princes and tsars of Muscovy. The Duma was discontinued by Peter the Great, who transferred its functions to the Governing Senate in 1711. Since the Novgorod revolution of 1137 ousted the ruling grand prince, the veche became the supreme state authority. After the reforms of 1410, the veche was restructured on a model similar to that of Venice, becoming the Commons chamber of the parliament. An upper Senate-like Council of Lords was also created, with title membership for all former city magistrates. Some sources indicate that veche membership may have become full-time, and parliament deputies were now called vechniks. It is recounted that the Novgorod assembly could be summoned by anyone who rung the veche bell, although it is more likely that the common procedure was more complex. This bell was a symbol of republican sovereignty and independence. The whole population of the city—boyars, merchants, and common citizens—then gathered at Yaroslav's Court. Separate assemblies could be held in the districts of Novgorod. In Pskov the veche assembled in the court of the Trinity cathedral. The development of the modern concept of parliamentary government dates back to the Kingdom of Great Britain (1707–1800) and the parliamentary system in Sweden during the Age of Liberty (1718–1772). In the United Kingdom, Parliament consists of the House of Commons, the House of Lords, and the Monarch. The House of Commons is composed of 650 (soon to be 600) members who are directly elected by British citizens to represent single-member constituencies. The leader of a Party that wins more than half the seats, or less than half but is able to gain the support of smaller parties to achieve a majority in the house is invited by the Monarch to form a government. The House of Lords is a body of long-serving, unelected members: Lords Temporal – 92 of whom inherit their titles (and of whom 90 are elected internally by members of the House to lifetime seats), 588 of whom have been appointed to lifetime seats, and Lords Spiritual – 26 bishops, who are part of the house while they remain in office. Since 1999, there has been a Scottish Parliament in Edinburgh, which is a national, unicameral legislature for Scotland. However, the Scottish Parliament does not have complete power over Scottish Politics, as it only holds the powers which were devolved to it by Westminster in 1997. It cannot legislate on defence issues, currency, or national taxation (e.g. VAT, or Income Tax). Additionally, the Scottish Parliament can be dissolved at any given time by the British Parliament without the consent of the devolved government. This applies to all devolved governments within the United Kingdom, a limit on the sovereignty of the devolved governments. In Sweden, the half-century period of parliamentary government beginning with Charles XII's death in 1718 and ending with Gustav III's self-coup in 1772 is known as the Age of Liberty. During this period, civil rights were expanded and power shifted from the monarch to parliament. While suffrage did not become universal, the taxed peasantry was represented in Parliament, although with little influence and commoners without taxed property had no suffrage at all. Many parliaments are part of a parliamentary system of government, in which the executive is constitutionally answerable to the parliament. Some restrict the use of the word parliament to parliamentary systems, while others use the word for any elected legislative body. Parliaments usually consist of chambers or houses, and are usually either bicameral or unicameral although more complex models exist, or have existed (see Tricameralism). 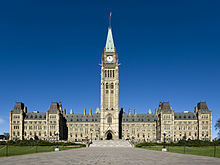 In some parliamentary systems, the prime minister is a member of the parliament (e.g. in the United Kingdom), whereas in others they are not (e.g. in the Netherlands). They are commonly the leader of the majority party in the lower house of parliament, but only hold the office as long as the "confidence of the house" is maintained. If members of the lower house lose faith in the leader for whatever reason, they can call a vote of no confidence and force the prime minister to resign. This can be particularly dangerous to a government when the distribution of seats among different parties is relatively even, in which case a new election is often called shortly thereafter. However, in case of general discontent with the head of government, their replacement can be made very smoothly without all the complications that it represents in the case of a presidential system. The parliamentary system can be contrasted with a presidential system, such as the American congressional system, which operates under a stricter separation of powers, whereby the executive does not form part of, nor is it appointed by, the parliamentary or legislative body. In such a system, congresses do not select or dismiss heads of governments, and governments cannot request an early dissolution as may be the case for parliaments. Some states, such as France, have a semi-presidential system which falls between parliamentary and congressional systems, combining a powerful head of state (president) with a head of government, the prime minister, who is responsible to parliament. The federal government of the Commonwealth of Australia has a bicameral parliament and each of Australia's six states has a bicameral parliament except for Queensland, which has a unicameral parliament. 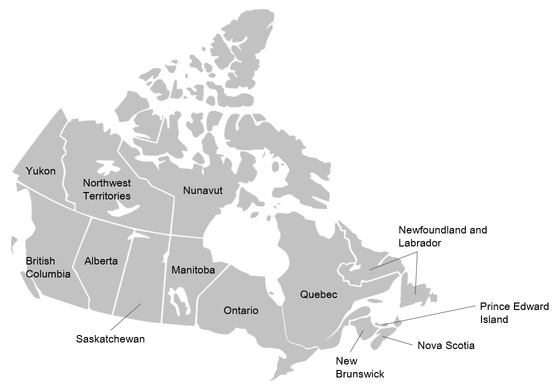 The federal government of Canada has a bicameral parliament, and each of Canada's 10 provinces has a unicameral parliament. within the capital's regional assembly however, there also exist two so-called Community Commissions (fixed numbers, not an automatic repartition of the regional assembly), a Dutch-speaking one and a Francophone one, for various matters split up by linguistic community but under Brussels' regional competence, and even 'joint community commissions' consisting of both for certain institutions that could be split up but are not. ^ Rush, Michael (2005). Parliament Today. Manchester University Press. p. 141. ISBN 9780719057953. ^ Parliament Online Etymology Dictionary. ^ Oxford English Dictionary, Third Edition, 2005, s.v. ^ Jacobsen, T. (July 1943). "Primitive Democracy in Ancient Mesopotamia". Journal of Near Eastern Studies 2 (3): 159–172. doi:10.1086/370672. JSTOR 542482. ^ Robinson, E. W. (1997). The First Democracies: Early Popular Government Outside Athens. Franz Steiner Verlag. ISBN 3-515-06951-8. ^ Bailkey, N. (July 1967). "Early Mesopotamian Constitutional Development". American History Review 72 (4): 1211–1236. doi:10.2307/1847791. JSTOR 1847791. ^ Larsen, J.A.O. (Jan. 1973). "Demokratia". Classical Philology 68 (1): 45–46. doi:10.1086/365921. JSTOR 268788. ^ de Sainte, C.G.E.M. (2006). The Class Struggle in the Ancient Greek World. Cornell University Press. ISBN 0-8014-1442-3. ^ Bongard-Levin, G.M. (1986). A complex study of Ancient India. South Asia Books. ISBN 81-202-0141-8. ^ Sharma, J.P. (1968). Aspects of Political Ideas and Institutions in Ancient India. Motilal Banarsidass Publ. ^ Abbott, Frank Frost (1901). A History and Description of Roman Political Institutions. Elibron Classics. ISBN 0-543-92749-0. ^ Byrd, Robert (1995). The Senate of the Roman Republic. US Government Printing Office Senate Document 103–23. ^ "The Shura Principle in Islam – by Sadek Sulaiman". alhewar.com. ^ "Shura and Democracy". ijtihad.org. ^ "Ayuntamiento de León – León, cradle of parliamentarism". www.aytoleon.es. Retrieved 22 February 2018. ^ Internet, Unidad Editorial. "La Unesco reconoce a León como cuna mundial del parlamentarismo". Retrieved 22 February 2018. ^ Spain (February 2012). "International Memory of the World Register [Nomination form] – The Decreta of León of 1188 – The oldest documentary manifestation of the European parliamentary system" (PDF). Retrieved 21 May 2016. ^ Haliczer, Stephen (1981). The Comuneros of Castile: The Forging of a Revolution, 1475–1521. Madison, Wisconsin: University of Wisconsin Press. p. 227. ISBN 0-299-08500-7. ^ Liebermann, Felix, The National Assembly in the Anglo-Saxon Period (Halle, 1913; repr. New York, 1961). ^ "Anglo-Saxon origins". UK Parliament. ^ Kaeuper, Richard W. (1988). War Justice and Public Order: England and France in the Later Middle Ages. Oxford University Press. ^ "Birth of the English Parliament: The first Parliaments". Parliament.uk. Archived from the original on 13 October 2010. Retrieved 13 May 2010. ^ "Was Oliver Cromwell the father of British democracy?". BBC.co.uk. Retrieved 5 November 2015. ^ "Hurstwic: Viking-age Laws and Legal Procedures". 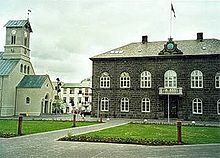 ^ "The Faroese Parliament" (PDF). ^ Downie Jr., Leonard (6 July 1979). "Isle of Man Marks Millennium with Pomp, Circumstance". The Washington Post. Washington DC. Retrieved 24 March 2013. ^ Enzo Gancitano, Mazara dopo i Musulmani fino alle Signorie – Dal Vescovado all'Inquisizione, Angelo Mazzotta Editore, 2001, p. 30. ^ Julian Go (2007). "A Globalizing Constitutionalism? Views from the Postcolony, 1945–2000". In Arjomand, Saïd Amir (ed.). Constitutionalism and political reconstruction. Brill. pp. 92–94. ISBN 9004151745. 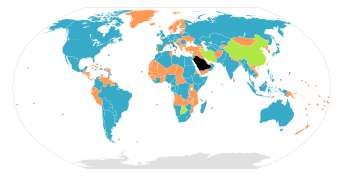 Wikimedia Commons has media related to Parliaments. Chisholm, Hugh, ed. (1911). "Parliament" . Encyclopædia Britannica (11th ed.). Cambridge University Press.